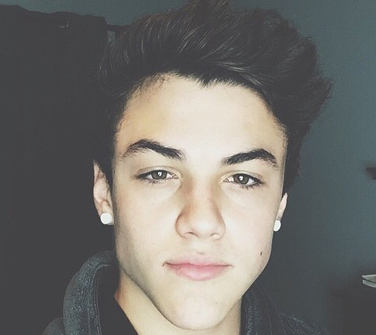 Ethan Dolan was born on December 16th, 1999 about 20 minutes before his twin brother, Grayson. They’ve pretty much latched onto one another ever since, enjoying huge success as the Dolan Twins on YouTube and Vine. In September of 2015, the twins signed on with the AwesomenessTV channel. Ethan is also a competitive wrestler. He and his brother competed at Madison Square Garden and won all their matches. They also enjoy skateboarding. Although born in New Jersey, the family now lives in California. The Dolan twins do so much together, that they are constantly pulling twin moves, including both injuring their left hands within a month of each other in 2016. Sometimes fans get a bit crazy as they did at the Dolan Twin’s appearance in June 2016 in New Jersey when 28 fans were injured (just minor injuries) when they rushed the stage. In addition to his twin brother, Ethan also has a sister, Cameron, who is also enjoying fame on Vine. In fact, it was Cameron that got her brothers started with Vine. His parents are Sean and Lisa Dolan. Ethan is reported to have dated Meredith Mickelson, which was revealed by Steven Kelly on Twitter. He and his brother have also made videos with other social stars, including Jack Dail, Kenny Holland, Amanda Cerny, Jake Paul, and many more.